Where’s The Bourbon Club in ROCK OF AGES? That’s where you will find Whisky A Go Go, the black and red dive upon which The Bourbon Club is based. The Whisky has been a fixture on Hollywood’s Sunset Strip since it opened in January 1964. It was just down the street from the equally famous, but short-lived Hullabaloo Club, and later Aquarius Theater. Absolutely everybody that was anybody in the rock and roll scene seems to have played there – The Byrds, Buffalo Springfield, Linda Ronstadt and (her then-backup band) The Eagles, The Doors, the Kinks, The Who, Cream, the Animals, Love. It was an unbelievable scene, that seemed to be going non-stop, seven days a week, 24 hours a day. I lived 10 minutes away from it; it was like the world’s biggest candy store. Looking back on it, I can’t believe there was such a place – but there was. I feel fortunate that I “got it” then, and spent every spare hour – and more – down there. It was a near-riot every night, it seemed, with people waiting and hoping to get into the club. Anti-war (Vietnam) demonstrators, rockers and druggies mixed and mashed. The police often got into the act, and many times it did lapse into a full-scale riot. I laughed in “Rock of Ages” when Stacee Jaxx (Tom Cruise) discusses burning down the club; I think at some point some or all of the club did burn. It looks (and smells) burnt to this day. The movie was only slightly far-fetched in depicting how various civic groups have, over the years, tried to close the place down – for public decency’s sake. The efforts were more pointed in the 1960s than in the early 1990s, as the movie suggests. The party morphed in the 1970s into a venue for then-nascent groups such as Led Zeppelin, The Ramones, The Police, Blondie and Van Halen. In the 1980s – the era the movie is primarily based upon – one could expect to regularly see top or up-and-coming acts such as Motley Crue, Metallica and Guns N’ Roses (prime inspiration for Arsenal and Stacee Jaxx in “Rock of Ages”). The club is still open, still hosting top acts – like a Black Sabbath reunion in 2011, and still rocking. The rock scene supporting it, however, has mellowed a bit. 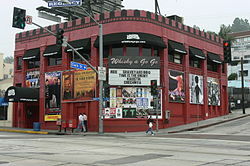 But if rock ‘n’ rock was a societal earthquake, the Whisky A Go Go was its epicenter. The fire was not at The Whisky on The Strip, it was in The Whiskey Au Go Go nightclub in Fortitude Valley, Brisbane, Australia. The fire killed 15 people. It occurred 8 March 1973. The building is at 356 St Pauls Terrace, Fortitude Valley (on the corner of Amelia Street and St Paul’s Terrace) and still stands as of 2013. I used to go the The Whisky, The Roxy (just a ways down from The Whisky) and Gazzarri’s a lot from 1977 to 1985 (I moved from LA). And The Starwood before it’s ultimate demise due to noise complaints from neighbors in 1981. I even named an incredible cat of mine Whisky (as opposed to the alcohol Whiskey which I’d never name an animal), and his sister Roxy. Also went to a few VIP parties that were held in the secret club below The Whisky. Sure miss that music scene back then. Something gives the Hollywood Whisky a burnt smell, even today. The late 1960s to the early 1980s in Hollywood was a moment in time that sadly will never be revisited. Greatest movie & cast of actors ever ! As a true rock and roll lover from Manchester in the UK its good to know that rock Of ages want as far fetched as most people believed…. we have the Marquee Club in London and the Hacienda in my home town…I was born in 1970 so grew up through what i believe was the best era of rock music…Queen..G n R….Led Zep…Dire Straits…Eric Clapton…Pink Floyd.. Good to know this place and places like this are still thriving…. they truly can’t be beaten for the quality and atmosphere of an unforgettable rock concert.